This entry was posted in Comments about Cycling on December 6, 2014 by Steve Tilford. I’ve been having trouble with my hands going numb while I‘ve been riding recently. It’s not numb from cold, it’s numb from pressure. Most riders have had this issue before I’d think. I don’t remember having it when I first started racing, but it seems to be way more common now. I’ve especially had trouble with my right hand. It first started, sort of consistently, after I crashed pretty hard, on ice, at the Jingle Cross, maybe 5 years ago. And now, this winter, it has gotten much worse. Lots of guys have problems with their hands going numb racing. I remember riding the Athen’s Twilight Criterium a while ago and it seemed that everyone around me were taking their hands off the bars and shaking them. That is from doing the death grip while racing. But this is different. I’m not sure the problem is position when I’m riding. I think it might be my position sleeping. I think that most of my issues are from sleeping with my elbow and wrists bend, or curled. I believe that I’m injuring my nerves when I’m sleeping and then it shows the symptoms when I’m riding. I got this idea from Robbie Robette, a friend from Austin. He’s a pretty smart guy and was having the problem. He said that he somewhat fixed his issues by trying to sleep with his arms straight, or at least not curled up tight. Here is a link to an article about hand numbness. There are a couple nerves that make different parts of your hands go numb. 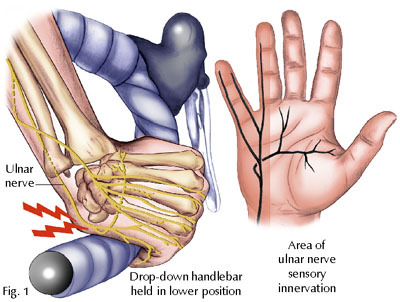 I have different sensations, sometimes it seems like the ulnar nerver, other times the median nerve. I also notice the problem is worse when I’m wearing thicker gloves. I’ve been wearing some Pearlizumi PRO winter gloves recently. They are super warm, but I have a very hard time holding the bars tight, or more accurately, the levers tights, when I’m riding. It is because the inside of the gloves kind of move around and the lining is slick compared to the outer shell. They are way better riding MTB bikes than holding my road levers. Whatever the reason, it is a drag having numb hands when it is cold. It disconcerting trying to tell if they’re numb from cold or pressure. With pressure, if I just take them off the bars for a few seconds and rub my fingers together, the tingling goes away and it feels normal. If anyone out there has a “cure”, or solution for this, many of us would like to hear it. These are the fingers that normally go numb, but not always. 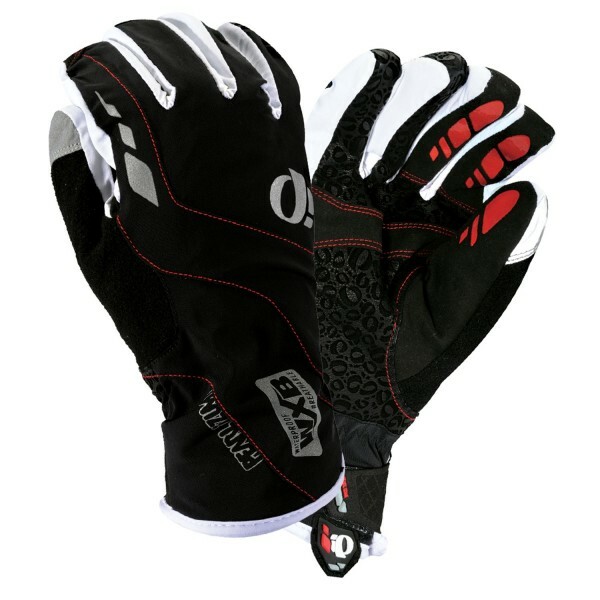 These are the gloves I’ve been riding. They are super warm, but my hands kind of squirm around in them. You could have carpal tunnel syndrome. You could obtain a wrist splint to wear at night and try not to bend your elbows in your sleep. You can also receive a cortisone injection, but it is temporary and painful ‘cuz they inject it into the tendon. Some say that B vitamins and EFAs can be helpful for this condition. Get a cheap pair of skateboarding wrist guards and sleep with them. They work the same as a splint you would get from a PT. They will keep your wrists from flexing when you sleep. Suggested to check ensure that you dont have some neuro compression at the cervical spine, shoulder, elbow or write. What’s worked for me on pretty much all my bikes is using the Softride stem to ease-alleviate the constant numbness I experienced during rides. The Softride stem has been the ticket to eliminating numbness for me, has been for years. As another 60 + yr old rider, give it a try on one of your bikes Steve…..You may like it. Could it be that your back muscles gotten weaker bc of the hip accident? I’ve had that problem with my left hand for over 30 years. On Mountain bike, it’s almost impossible to make it go away, but it’s not hard on a road bike. I just put my let hand behind my back and clench and unclench my had a few times. .. It’s not safe to do that in a race, so I just use he old shaking of the hand trick, a few laps before the bell. I’m just glad it’s not my right hand. Someone told me to quit wearing padded gloves- I did that, and the numbness is mostly gone. Can’t explain it, but it worked! I would just wait and see before you take any drastic action like changing your position or fit . I have this problem , it comes and goes . It well feel almost chronic for a week or 2 then disappear for 6 months .If it continues Id start with a chiropractor . Nothing like an adjustment to make you right and relieve any pressures . As a biped, you are built to lean on your feet. This is what the bicycle is built to capture. The leverage of the upper body pressing through the core to the feet is the first step in reprogramming your biomechanics on the bike. If you lean on your hands, you interfere with the natural mechanism, and worse, stuff stress/compress connective tissue from the hands, wrists, elbows, shoulders, neck, spine, lower back and into the saddle. All common pain locations for cyclists. Train your core, trust your core, lean on your core. Don’t lean on your hands, not anymore. Once you break from the habit of pushing/leaning on the hbars, you will be poised to draw on the handlebars for leverage, even when you don’t notice it. Enabling muscles from hands, through the shoulders, through the core to the feet. I no longer have any pain issues and am getting incredible watts. Hey Steve, I enjoy your posts but rarely comment. I do construction and quite a bit of tile which as you know requires a lot of hands and knees work (and elbow) that can wreak havoc on your elbow tendons. The narrowing of the nerves running through the bottom of the elbow cause numb hands that happen to me quite often off the bike. Good luck and I hope its just the a bike position tweak. What I have found is that certain jersey cuts constrict at the underarms just enough so you don’t notice, but just enough to constrict blood flow just enough to the hands and fingers so they go slowly numb. Certain jerseys are worse than others and I have to sometimes pull at the underarms to get them loose enough for blood to flow again. Try this next time. And try and make a note of which jerseys are worse than others for you. I broke my left (off) hand last year in a strange fall while riding in traffic. Subsequently the doctor’s staff put the cast on too tight and I got a nerve compression injury in my arm. I even got a mild case of RSD (reflexive sympathetic dystrophy – you can look it up if you want). Point being the nerves going down my arm into my hand were injured. I solved the problem by doing two things or maybe three things. One, I bought a big, aerodynamic handlebar with a flat top. When I sit on the tops the difference in surface area for my hands between this and a round bar is absolutely ridiculous. It’s like three times as much area. That makes a massive difference for how much pressure gets put on your hands. Two, I’m running Hed Plus rims. My tires are measuring out to about 27 cm. I’m running about 75 PSI front/100 rear. The amount of vibration making it to my hands is vastly reduced to begin with from this setup, and the wider bar distributes the vibration over a larger area. Last, there are off the bike exercises that you can do to stretch the nerves, muscles, and tendons. These are not that hard to do and any good physical therapist or some internet research could reveal them to you. What really helped my was lying flat on my back and raising my arm up at 90, hand extended. Then gradually bend your wrist to 90 degrees. You can also do the same kind of thing with your fingers (not your thumb). Arm and hand straight, fingers bend to 90. If you can get flexibility in the nerve, it’s going to be more resilient and not go numb as easily. Obviously being properly fit to the bike is not an issue you want to rule out here. And you want to move your hands around on the bike, stand up periodically, all that stuff. Stuff you’re probably already doing, of course, still worth the mention. With these modifications and techniques I went from a badly damaged hand to no problems. I also did get physical therapy involving dry needling, and that helped a lot too. I’m a soon-to-be retired US Army Occupational Therapist. I spent 20 years treating people with much the same complaints that you describe. Instead of getting inaccurate guesses at a diagnosis and sketchy treatment techniques (for instance – nerves don’t stretch), you ought to go see your doctor and get an EMG or nerve conduction study to pin point the problem where the nerves are getting compressed. Is it in your elbows???…wrists????….neck???? The symptoms you describe could be coming from any one, or more of those areas, and treating the wrong thing will only waste your time while the problem gets worse, and solutions get more difficult and invasive. Get a proper medical opinion. You’ll be happy you did. I second this. Splints are a huge help. Steve — all your driving may be a contributing factor. I suffer from a very similar condition due to cycling / crashes / writing for a living. Gripping the steering wheel, and the high-frequency vibration that goes with it, seems to exacerbate my hand numbness. Giving the hand and wrist time to relax and recover is crucial to letting the soft tissue heal. I meant to say stretching the tendons rather than nerves, I’m certainly lost in the weeds to some extent here but what I did worked. I had a lot of trouble with tendons being tight post-injury, of course. I’m a computer specialist not a medical professional. Bottom line I agree, go get some professional medical advice. Here is an option that is outside of the box. There is a form of body work that is structurally based and VERY gentle. Pain tends to ease with Ortho-Bionomy. Educational movements may be taught to help perpetuate the release of tension and muscle contractions. The release of tension and stress in the body brings about the relief from pain and discomfort. Function, structural alignment, balance and overall well-being improve. These benefits generally continue after the session is finished. Sometimes the body’s natural ability to remain balanced is short-circuited by stress, injury, accident, improper posture, emotional experiences or by overtaxing the body’s limits. When the body is out of balance, it adapts as well as it can, but in the process it may create patterns of even greater stress. The simplicity of Ortho-Bionomy means the practitioner and client may work together to re-educate dysfunctional patterns and restore normal functioning. IE, breaks the cycle of pain!!! Plus, the re-education would be so beneficial to your hip, I know this because I have worked w/two clients know that have had hip replacements. One of those clients I was able to work w/before the surgery, double hip replacement, the organization of the attachments has been amazingly quicker. Thats coming from the Doc’s mouth!!! I googled practitioners off the Society of Ortho-Bionomy web site and found two practitioners in Kanas. I have no idea how close they are to you but its worth a phone call to ask some questions. #1 Ruth Cooper in Newton, KS and #2 Debra Peterson in Courtland, KS. Last but not least, dig the craftsmanship of the tile work!! And if you ever roll through Grand Junction Colorado, I will give you a session of Ortho, we can then walk across the street, you can buy me a brew. Something that might help in the short term- use bar mitts instead of thick gloves. They are available for both mtb and road. They do look dorky but definitely warm. Everyday posture can have some effect on this but you need a good bike fit. I will be glad to send one of our BikeFit Pros to set you up. Part if this is simply aging and slight misalignments now bothers us that didn’t when we were younger.